Crispy vegetable spring rolls. Home made Thai style served with a plum dipping sauce. Crispy vegetable & pork spring rolls. Home made Thai style served with a plum dipping sauce. Crispy vegetable & duck spring rolls. Home made Thai style served with a plum dipping sauce. Mildly spiced golden vegetable patties served with your choice of sweet plum or sweet chilli dipping sauce. Mildly spiced golden fishcakes served with your choice of sweet plum or sweet chilli dipping sauce. Mixed vegetables in crispy golden batter served with a sweet chilli dipping sauce. Succulent tiger prawns in crispy golden batter served with a sweet chilli dipping sauce. 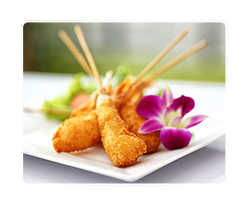 Delectable tiger prawns, mussels, fish and squid coated in a crispy batter & served with a sweet chilli dipping sauce. Marinated pork morsals on skewers with a spicy dipping sauce. Marinated pork spare ribs given the Baan Siam salt & pepper treatment. Marinated chicken wings given the Baan Siam salt & pepper treatment. King sized steamed mussels prepared with Thai herbs & served with an exclusive home made seafood dip. Egg coated fried mussels in batter with spring onions and bean sprouts served with both spicy & sweet chilli sauces. 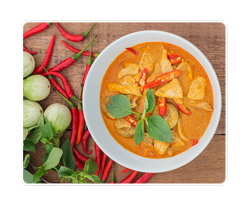 Your choice of chicken, beef or pork served in a lively red curry lovingly made with coconut milk, bamboo shoots fresh herbs, spices & a variety of fresh vegetables. 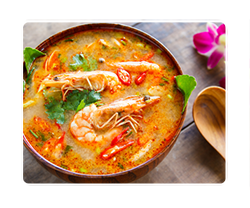 Tiger prawns served in a velvety green curry made with coconut milk, bamboo shoots, herbs & a host of fresh vegetables. Mixed seafood served in a velvety green curry prepared with coconut milk, bamboo shoots, herbs & spices, mangetout, dwarf beans, chillies, carrots, potatoes and baby corn. Your choice of chicken, beef or pork served in a velvety green curry made with coconut milk, bamboo shoots, herbs & a variety of fresh vegetables. Tiger prawns served in a creamy yellow curry prepared with spices, coconut milk, herbs & a host of fresh vegetables. Mixed seafood served in a creamy yellow curry prepared with coconut milk, fresh herbs & spices, mangetout, bell peppers, ginger, potatoes, baby corn, carrots & onions. Your choice of chicken, beef or pork served in a creamy yellow curry prepared with coconut milk, herbs & spices and a host of fresh vegetables. Tiger prawns served in a traditional southern curry prepared with coconut milk & a variety of fresh vegetables to produce a creamy yellow dish with an increased depth of flavour. Mixed seafood served in a southern traditional curry prepared with coconut milk, potatoes, bell peppers, mangetout, onions, fresh ginger, herbs & spices to produce a creamy yellow dish with an increased depth of flavour. Your choice of chicken, beef or pork served in a traditional southern curry prepared with coconut milk & a variety of vegetables to produce a creamy yellow dish with an increased depth of flavour. Tiger prawns served in"Jungle Curry". This extremely spicy dish with its thin consistency is prepared with herbs & spices, bamboo shoots, mangetout, baby corn, mushrooms, dwarf beans & chillies. Milder version prepared on request!! Mixed seafood served in"Jungle Curry". This extremely spicy dish with its thin consistency is prepared with herbs & spices, bamboo shoots, mangetout, baby corn, mushrooms, dwarf beans & chillies. Chicken, beef or pork served in ''Jungle Curry". This very spicy dish with its thin consistency is prepared with herbs & spices, bamboo shoots, mangetout, baby corn mushrooms, dwarf beans & chillies. Your choice of chicken, beef or pork served in a distinguished red curry prepared with herbs & spices, kaffir lime leaves and coconut milk. (See "House Specials" for alternate version). Mixed seafood stir fried in a spicy red curry sauce prepared with coconut milk, herbs & spices, kaffir lime leaves & dwarf beans. Prawns with chillies & an assortment of fresh vegetables. Chicken with chillies & an array of fresh vegetables. Cod loin in roasted chili oil and with a variety of fresh vegetables. Tiger prawns in roasted chili oil with a host of fresh vegetables. Mixed seafood in roasted chilli oil with onions, tomatoes spring onions, carrot batons, bell peppers, dwarf beans, mangetout, baby corn & mushrooms. Your choice of chicken or pork in roasted chili oil and with an array of fresh vegetables. 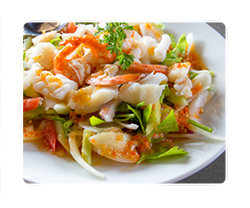 Tiger prawns in oyster sauce with a variety of fresh vegetables. Your choice of chicken or beef or pork in oyster sauce with a large array of fresh vegetables. Cod loin in sweet & sour sauce with a variety of fresh vegetables. King prawns in sweet & sour sauce with a host of fresh vegetables. Your choice of chicken or pork in sweet & sour sauce with an assortment of fresh vegetables. 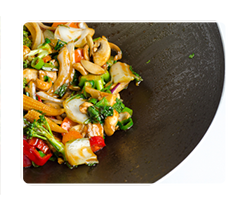 Stir fried cod loin with ginger & a variety of fresh vegetables. Tiger prawns with ginger & an array of fresh vegetables. Mixed seafood with ginger, mushrooms, bell peppers, mangetout onions, baby corn, spring onions & diced carrots. Your choice of chicken or pork with ginger & a variety of fresh vegetables. Tiger prawns with sweet basil, garlic, bell peppers, dwarf beans, mangetout, baby corn, onions & chillies. Tiger prawns, cod loin, mussels and squid with sweet basil, chillies, garlic and a variety of fresh vegetables. 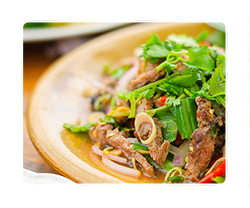 Your choice of chicken or minced pork with sweet basil, chillies, garlic and a variety of fresh vegetables. Tiger prawns in very spicy South Thai style chilli paste with bamboo shoots, dwarf beans & chillies. Your choice of chicken or pork in very spicy South Thai style chilli paste with bamboo shoots, dwarf beans & chillies. Very spicy fish dish (cod loin) with galangal, kaffir lime leaves. bamboo shoots, bell peppers, chillis, carrots, dwarf beans mangetout & baby corn. Very spicy tiger prawn dish with galangal, kaffir lime leaves, mangetout, bamboo shoots, peppers, carrot, beans, baby corn and chillies. Very spicy chicken with galangal, kaffir lime leaves, mangetout, bamboo shoots, peppers, carrot, beans, chillies and baby corn. Chicken with cashew nuts, spring onions, onions, bell pepper, mangetout, baby corn, diced carrot & grilled chillies. Pork in a peppery garlic sauce with a touch of coriander. Tiger prawns with bamboo shoots & egg. Tiger prawns with bean sprouts & egg. Thai style minced pork omelette served with a sweet chilli sauce. Succulent duck in red curry prepared with coconut milk, pineapple, tomatoes, fresh herbs & spices, bamboo shoots, bell peppers & slivers of carrot. Stir fried crab, tiger prawns or scallops uniquely prepared with yellow curry powder, onions, spring onions, celery and bell peppers. Low heat but big flavour! Cod loin deliciously preared with yellow curry powder, onion, spring onions, celery & bell peppers. A fish lovers delight. Tangy steamed fish (cod loin) in a light soy sauce with ginger, mushrooms, spring onions and coriander. Served with a spicy garlic & lemon sauce. Deep fried fish (cod loin) dressed in a three flavours sauce with spices and fresh vegetables. A rich fillet or salmon wok fried and topped with a fragrant & creamy curry sauce. Your choice of chicken, beef or pork served in an old style red curry prepared with herbs & spices, kaffir lime leaves & coconut milk. A mouthwatering combination of tiger prawns, mussels, squid and fish (cod loin) served with egg noodles and beansprouts or rice noodles accompanied by our exclusive satay sauce or a mild yellow curry sauce. Spaghetti stir fried with beef, herbs & spices, mangetout, baby corn, onions, chillies, bell peppers, dwarf beans & carrots. 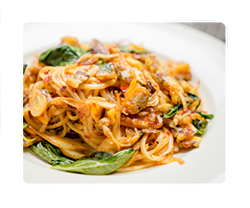 Stir fried spaghetti with chicken or minced pork with herbs & spices, chillies & an array of vegetables. Stir fried spaghetti with tiger prawns in green curry and an array of accompanying vegetables. Stir fried spaghetti with chicken in green curry & variety of accompanying vegetables. Stir fried spaghetti with tiger prawns in red curry and a host of accompanying vegetables. Stir fried spaghetti with chicken in red curry and an array of accompanying vegetables. Stir fried sweet & sour spaghetti with tiger prawns, pineapple & bell peppers. Stir fried sweet & sour spaghetti with your choice of chicken or pork with pineapple & bell peppers. Stir fried rice ribbon noodles with tiger prawns, egg and a variety of fresh vegetables. Stir fried rice ribbon noodles with your choice of chicken or pork with egg & a host of fresh vegetables. Stir fried rice ribbon noodles or egg noodles with gravy, tiger prawns, egg & choice vegetables of the day. 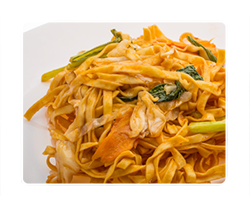 Stir fried rice ribbon noodles or egg noodles with gravy and your choice of chicken or pork with egg and fresh vegetables of the day. Wok fried egg noodles with chicken, beansprouts, baby corn, carrots, spring onions & oyster sauce. Famous Thai noodle dish featuring narrow stir fried rice noodles with tiger prawns, egg, Phad Thai sauce, bean sprouts, dwarf beans & spring onions. 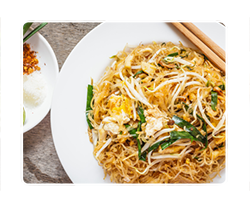 Famous Thai noodle dish featuring narrow stir fried rice noodles with chicken, egg, Phad Thai sauce, bean sprouts, dwarf beans & spring onions. Famous Thai noodle dish featuring narrow stir fried rice noodles with egg, Phad Thai sauce, bean sprouts, dwarf beans & spring onions. Stir fried narrow noodles with beef, herbs & spices, chillies and an array of fresh vegetables. Fragrant tiger prawn fried rice with egg, mixed chopped vegetables. Your choice of chicken or pork fragrant fried rice with egg and mixed chopped vegetables. Fragrant crab fried rice with egg and mixed chopped vegetables. Spicy tiger prawn fried rice with basil, mushroom, chillies and bell peppers. Spicy minced pork fried rice with basil, mushroom, chillies and bell peppers. Note: All ingredients for the dishes below are suitable for vegetarians. 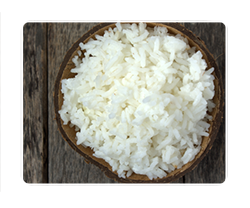 Customary Thai ingredients such as fish sauce and shrimp paste are purposefully excluded! Renowned hot & sour spicy tofu soup with lemongrass, vegetables, fresh herbs, chillies & coconut milk. Luxurious creamy coconut soup with tofu, lemongrass, mushrooms, tomatoes, galangal, onions & various herbs. Mild clear soup with tofu, glass noodles, onions & coriander. Spicy salad with stir fried tofu dressed with limejuice, shallots mint, coriander, lemongrass, roasted ground rice & fresh vegetables. Stir fried tofu on a fragrant bed of spring onions, lime juice, carrots, cucumber, tomato, fresh chillies, herbs & spices. Tofu served in a red curry lovingly made with coconut milk, bamboo shoots, fresh herbs & spices dwarf beans, chillies, carrot slivers & baby corn. Tofu served in a velvety green curry made with coconut milk, bamboo shoots, fresh herbs & spices, dwarf beans, chillies, carrot slivers, potatoes & baby corn. Tofu served in a creamy yellow curry prepared with coconut milk, fresh herbs & spices, bell peppers, potatoes, carrot slivers & onions. Tofu served in "Jungle Curry". This extremely spicy dish has a thin consistency and is prepared with fresh herbs & spices, bamboo shoots, mushrooms, dwarf beans, mangetout, baby corn & chillies. Milder version prepared on request!! Stir fried tofu in roasted chilli oil with onions, tomatoes, spring onions, carrot battons, bell peppers, dwarf beans, mangetout, baby corn & mushrooms. Stir fried tofu in spicy red curry paste, coconut milk, kaffir lime leaves and dwarf beans. Stir fried Tofu in oyster sauce with bell peppers, tomatoes, spring onions, mangetout, mushrooms & diced carrots. Stir fried tofu with sweet basil, garlic, bell peppers, dwarf beans, mangetout, baby corn, onions & chillies. Stir fried tofu with ginger, mushrooms, onions, spring onions, mangetout, baby corn & diced carrots. Spicy stir fried tofu with onions, tomatoes, spring onions, diced carrots, dwarf beans & fresh chillies. Tofu stir fried together with yellow curry powder & egg with bell peppers, tomatoes and celery. Fragrant tofu fried rice with egg & mixed chopped vegetables of the day. Spicy tofu fried rice with basil, mushroom, chillies & bell peppers. Famous Thai noodle dish featuring narrow stir fried rice noodles with tofu, egg, Phad Thai sauce, bean sprouts, dwarf beans & spring onions. Stir fried rice ribbon noodles with tofu, egg & mixed vegetables of the day. Stir fried rice ribbon noodles, tofu, egg, mixed vegetables of the day and gravy. Mixed vegetables of the day in red curry paste. Mixed vegetables of the day in roasted chilli paste. Stir fried noodles with garlic. Stir fried spaghetti with garlic.